7 April 2019. The challenge is open to experienced and new runners from all across Cape Town, on a beautiful trail through Bellville’s public green spaces. The event features a five-kilometre family run and a more arduous, challenging 14-kilometre run. Most of the route is off the tarmac, offering participants a chance to enjoy beautiful natural surroundings in the heart of the city. Fantastic prizes will be awarded to the top three male and female runners in each category and exciting lucky draw prizes will be on offer during the day. Every runner will receive a water-wise plant as a medal in recognition of their participation. Each entrant is asked to bring old and unused running gear and other clothes, which will be donated to local charities. A percentage of the proceeds of the GTP Urban Trail will be used to maintain and upgrade the running route to ensure maximum enjoyment for everyone in the future. 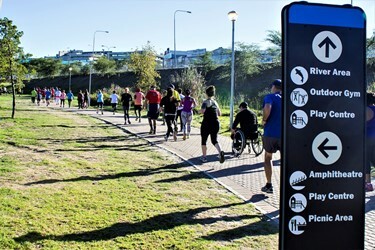 After the event, the urban trail route will remain open for runners, walkers and strollers who want good quality, safe running, walking and leisure routes in their city. Food trucks and other stalls will be available on the day, selling food, drink and other goodies.